The CV35 klystron was an English designed radar tube and manufactured in Australia during the second world war. The tube itself was designed in Britain by Electric and Musical Industries Ltd., in 1941 and was adopted for Australian equipment in 1942. The Council for Scientific and Industrial Research (C.S.I.R.) Radiophysics Division assembled several samples prior to contracting. The klystron was developed in 1939 by R.H. and S.F. Varian at Stanford University USA. This basic design was improved upon by R. Sutton and his team at the Admiralty Signal School Extension, Bristol, towards the end of 1940 by the development of an operating reflex klystron which was subsequently tested in early 1941. 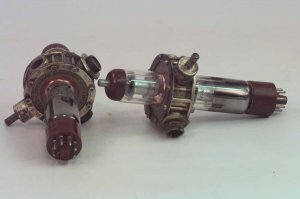 The reflex klystron was often referred to as the Sutton Tube. When developed the klystron's purpose was to serve as an oscillator in radar receivers in WWII. In fact the invention of the microwave radar was made partially possible by this development. Klystrons are high-vacuum devices based on the interaction of well-focussed pencil electron beam with a number of microwave cavities that it traverses (resonators), which are tuned at or near the operating frequency of the tube. The principle is conversion of the kinetic energy in the beam, imparted by a high accelerating voltage, to microwave energy. Conversion takes place as a result of the amplified RF input signal, causing the beam to form 'bunches'. These give up their energy to the high level induced RF fields at the output cavity. The amplified signal is extracted from the output cavity through a vacuum window. The first use of the reflex klystron was in the Type 271 Naval Radar System mid 1941. Klystrons after the war have been used in high powered linear accelerators, radar, UHF-TV, satellite communications and industrial heating. D.L. Hollway, The Manufacture of a Reflex Klystron. I.R.E. Proceedings, October 1947.